Children's interest in books is apparently on the wane. We have come a long way since those good old days when one common source of entertainment for children constituted stories they listened to lying on their grandmothers' laps. By the time the grandmother's collection was exhausted the child had already started to peep into the world of books; he crossed over from childhood to boyhood reading fairy tales, ghost stories, thrillers, detective novels that were there in the tiny 'family bookshelf' in one corner of the house or at a nearby library. In this age of digital smartness grandmother's lap has now been replaced by cartoons and books have lost their place to computer games. Poor substitutes no doubt but that is reality. This is however a universal phenomenon and there have been efforts to counter this downslide of interest in books among today's children. One particular tactic that has apparently worked quite well is making the book visually attractive. Because when it comes to attracting the child's attention the presentation or look of a book is of immense importance, sometimes even more than the content inside. The conventional look of books began to fake cushions and ingenious shapes -- in many of the western countries for the last one and a half decades. Nothing was happening in Bangladesh though. Not until 2000. The credit goes to Progoti Publishers that first ventured in such uncharted territory in 2000. "One of my acquaintances once showed me a children's book published in England and asked if we could do the same. There were 'pop-ups' in the book alongside text. I worked as a teacher for some time, had interest in publishing and, most importantly, owned a press," Asrar Mahmud, a writer and the man behind the unique endeavour, relates how it all started. He teamed up with four others including Unmad-fame cartoonist and writer Ahsan Habib, who is also the art designer of Progoti, Sazzad Kabir, Khurshid Hasan Rumi. In the next three years, some of well-known bookshops like Zinat in New Market as well as up market chain shops like Aarong, Agora, Meena Bazar would be eagerly displaying some 25 books by Progoti. Although 3 years is too short a time to judge the success of such a venture, it is evident that popularity of the books is growing slowly but steadily. It is easy to distinguish Progoti's books because of their un-bookish look. One cannot but help taking a peek into the vibrantly illustrated and curiously shaped books whether the reader is 30 something or a 5 year old. Especially for a child, with his natural inquisitiveness and curiosity, the visual appeal of the books is almost unfailing. "You cannot attract a 4-year old to a book for its literary value, but when he sees a book shaped like a fish or a train and discovers equally eye-catching illustrations inside he takes interest in it on his own," Masud says as he displays some of the books with ‘di-cut’. A di-cut book means giving the book a certain shape the shape of a fish or a tiger or a train. 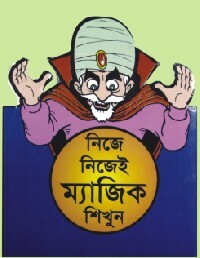 Most of Progoti's books are di-cut, a technique Masud claims wasn't applied in books ever before in Bangladesh. Then there are these pop-ups, which give a book a more distinguished and interesting look than di-cuts do. Pop-ups refer to the design where the illustrated human or animal figures or even things are done in such a way that they look as if they are coming out of the page. So far Progoti has done pop-ups in only two books in Pantaburi and Bagh o Harineer golpo, because, Masud points out, though children have liked them very much, many of their parents find the price too much to spend on a fun read. Progoti's books cover a wide range of subjects. Story books -- both original ones like Bhoot and Goenda Gogon by Ahsan Habib and edited collections like Pantaburi, Nasiruddin Hozza's Golpo. 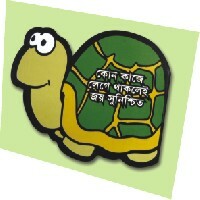 Books on general knowledge -- on trains, crocodiles, tiger, frog, birds of Bangladesh etc with the aim to impart the most elementary things about a particular subject. Written in a child-friendly way texts are invariably accompanied by beautiful graphic design and colourful illustration. Again, books on magic, palmistry and drawing are there to cater to children with special interest in these areas. The response so far has been satisfactory. "Our main problem is we haven't yet been able to arrange for enough outlets. With only a handful of outlets like those of Aarong, Aagora or Zinat we have reached a very limited readership. Until we've been greatly dependent on the Ekushey Boi Mela," he explains. He also reveals one or two future plans of Progoti: " We are working on a dictionary for children that will be the first of its kind." The most exciting revelation is however reserved for comic lovers: he adds secretively, at least four comics by Ahsan Habib are due to hit the bookstall in a few months time.